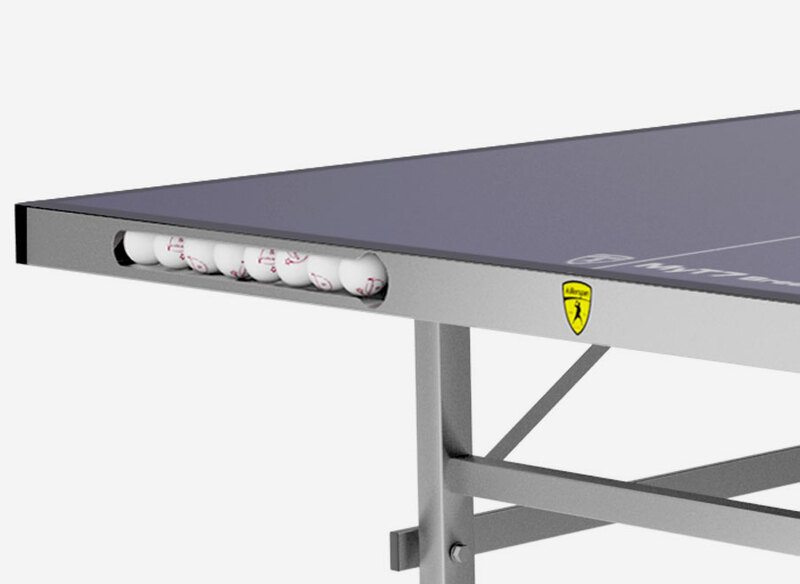 The Killerspin MyT7 Breeze outdoor ping pong table is a new addition as of the Summer of 2016. 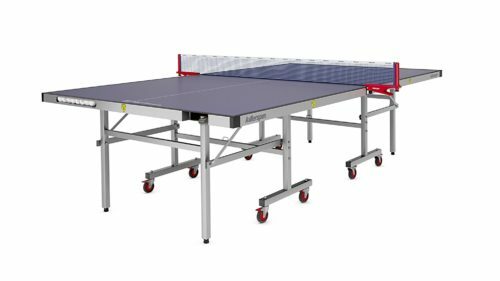 The MyT7 Breeze is a beautiful outdoor ping pong table from Killerspin that offers a weatherproof design and good looks. 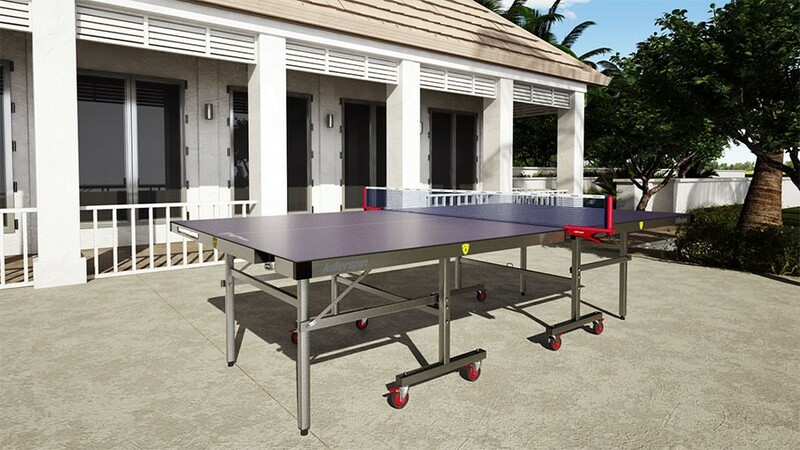 Priced at just under $1000, the Killerspin MyT7 Breeze is perfect for families that want the luxury of playing ping pong in their backyards and not worrying about the table holding up to the conditions. These outdoor tables are completely weatherproof and can withstand moisture, rain, sun, frost, etc. They are slightly more expensive than their indoor counterparts, but with the option to play outdoors, they are totally worth it. We had the opportunity to use this table while at the Killerspin house in Chicago and our complete review is below. 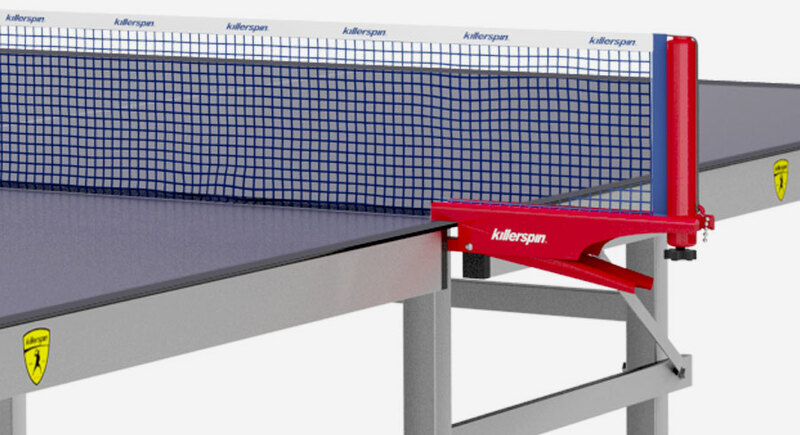 A similar model is the Killerspin MyT7 Blackstorm. As a direct comparison with another brand – we suggest looking at the Cornilleau 250S – it comes with a 10 year warranty on the tabletop and superior ball bounce for outdoor play. 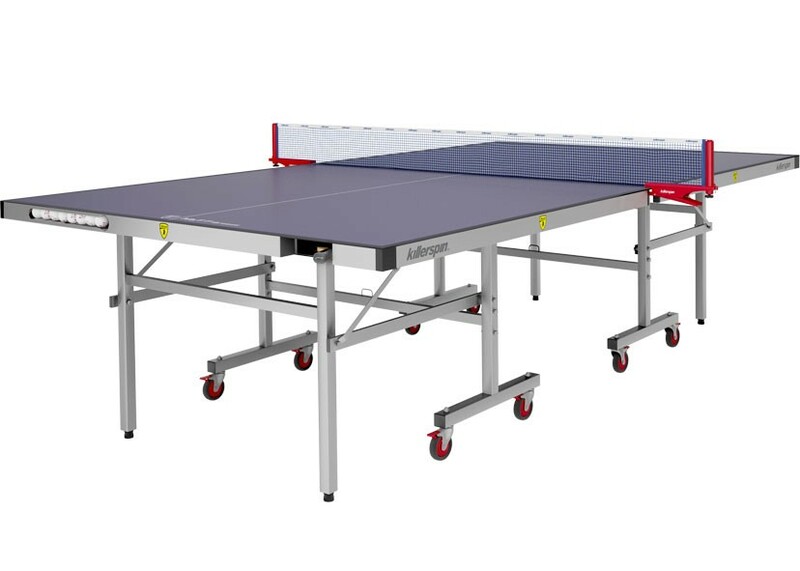 Frame/Design – The frame is a key area with any outdoor ping pong table. You want it to be stable and durable. The Killerspin MyT7 Breeze has a steel undercarriage with 3 inch caster wheels so moving it is easy. Weather resistant materials are very important since the table will be stored outdoors in most cases. The MyT Breeze provides an excellent outdoor playing opportunity no matter where you live. We’ve seen these tables in tropical environments, extreme heat and sun locations, and even in areas where it’s cold with snow in the winter. The long durability is what sets these outdoor tables apart from the indoor models. 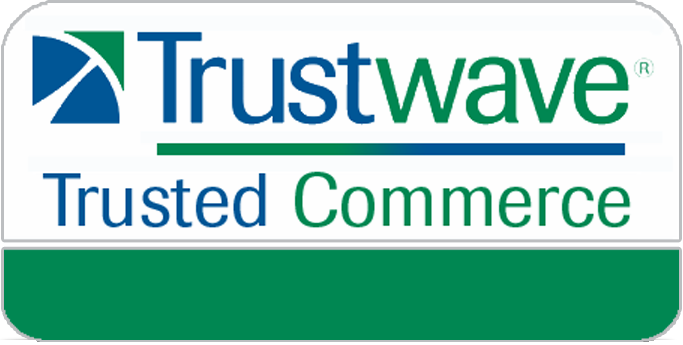 We do suggest a cover to keep the dirt and dust off of them, but otherwise they will last outdoors for years without a problem. 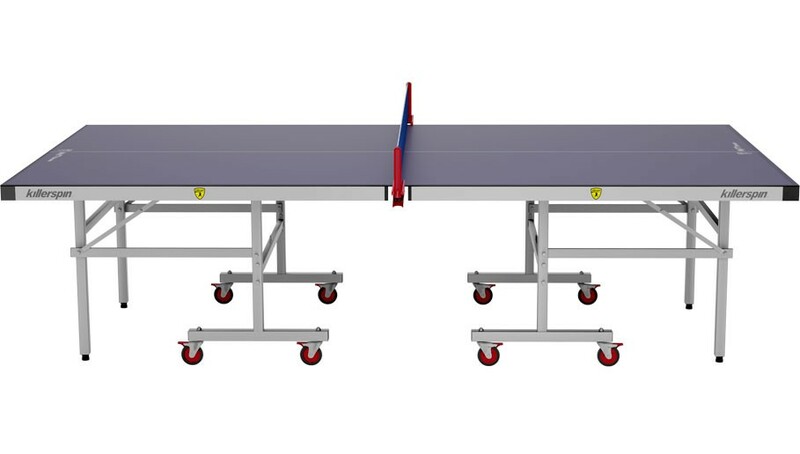 The frame design on Killerspin tables are manufactured so the end user can put them together easily. Overall a great table for the price and it looks good too. See the photos of this one both indoors and outdoors. Very stylish and modern. Playability – The MyT7 Breeze from Killerspin features a 4mm aluminum plastic weatherproof playing surface that is just mid-range on tabletop thickness. By comparison, the Cornilleau 250S Crossover table has a 5mm laminate surface that is considered one of the best in the industry for tables under $1000. The ball bounce is about average and you can get a level playing surface by adjusting the leg levelers. 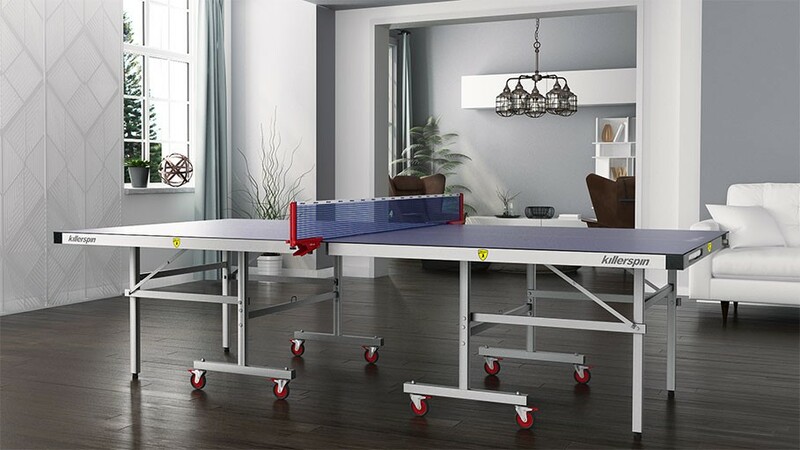 The ability to store ping pong rackets and balls on the ends of the table is very convenient. Playback mode is simple to get into – if you want to practice hitting without an opponent around. Assembly – It doesn’t get any easier than Killerspin when it comes to assembly times. You are looking at about 15-minutes to setup this outdoor ping pong table with only eight nuts and bolts. The two tabletop halves come pretty much assembled which makes this very easy to put together. Slide the two halves together and attached the net and you are done. The one downfall to this system is that every time you want to store the table away you have to take the net off. Even when putting the table into playback mode the net should removed. So in the long run, this table requires more work than the other tables that take longer to put together initially. Whenever possible we include videos on assembly for all models, but typically that is not required with Killerspin. The only other brand that comes close with ease of assembly is JOOLA.